When it comes to eye exams your regular eye doctor and pediatrician can guide you about how often you should return for a general checkup. However when dealing with a child’s developing vision it becomes more imperative to have frequent checkups with an optometrist or developmental optometrist if you believe your child is having difficulties learning and developing age appropriate skills when playing. If children do not receive regular eye exams from an early age, there are risks to their development that go beyond just having issues in class or athletics. As the body grows the mind builds a relationship with its functions; just as the mind understands how to use the legs to walk, or the mouth to speak, it understands how to use the eyes to see. If a child is learning to see with an undiagnosed vision problem it is possible that they could learn to accommodate to their vision issue and develop symptoms such as a lazy eye, crossed eye or wandering eyes, as well as issues related to physical development and behavior. Focus and Follow: Once a child is three months old, they are able to focus on an object and follow its movement, testing this ability after six months allows the doctor to test binocularity and eye strength in general. Pupil Response: The pupils should dilate and shrink when introduced to different levels of light, the doctor will check that these responses are normal. Preferential looking: This test ensures that the baby has normal reactions and eye function by utilizing blank and patterned cards to attract the child’s gaze. If a child does pass all of these tests it does not mean that they will not need vision correction in the future, but it is a good sign for their pediatric development. When a child reaches three years old they have almost developed complete full retinal tissue maturity, although the tissue will continue to develop slowly for the next four or five years. 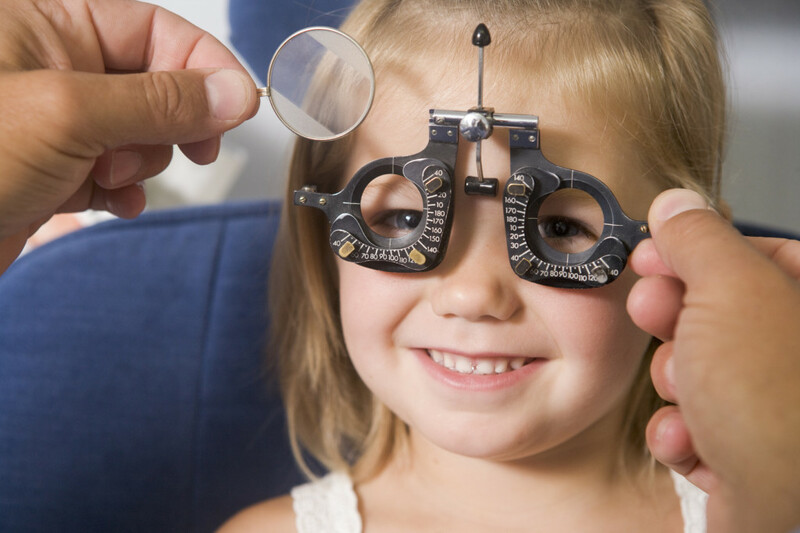 During this checkup for your toddler it is absolutely necessary that you raise any concerns both large and small, and family history so that the doctor has an appropriate assessment of the child’s vision issues on a daily and genetic basis. The exam at this age is more procedurally similar to a normal adult eye exam and is necessary as this is one of the last stages of development in which an optometrist can correct any issues before it becomes a major visual impairment. Since this is the last exam before a child enters the regular school system it may be one of the most important. At their five to six year old checkup it will be decided if a child does or does not need glasses, if their need for visual correction goes unnoticed they could develop learning issues, physical vision problems and experience harsh frustration in tasks that other children do with ease. For any eye exam needs refer to the offices of Drs. Tod Davis and Amy Carlyle of Developmental Optometry and Vision Therapy Services, we are one of the most talented and caring optometry practices for both adults and children in Virginia. Virginia Vision Therapy Center © 2018 All Rights Reserved. Powered by UBMe, Inc.